Infrastructure issues are an issue for states across the nation and Tennessee is not an exception. A recent research report released by the Tennessee Advisory Commission on Intergovernmental Relations indicated the state would need more than 45 billion dollars over the next five years to address aging infrastructure problems across the board, including transportation and utilities. These growing issues have many states taking to the air to address the problems affecting roads, utilities, public transportation and more. 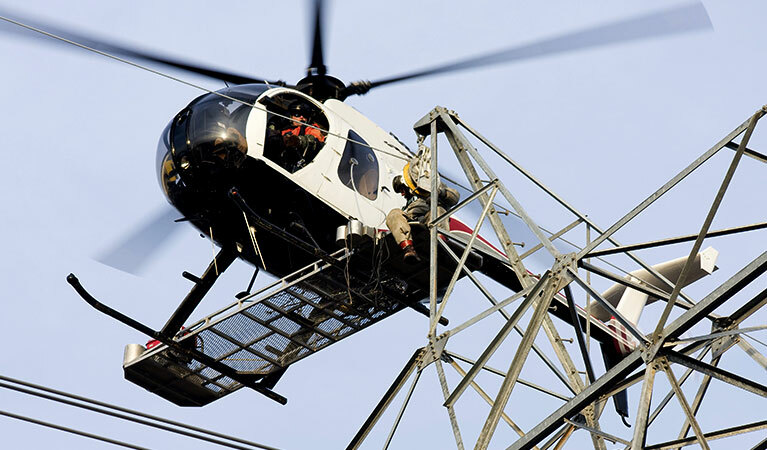 Helicopters have become an essential component of transmission line construction because they offer cost-effective solutions that get the job done faster than conventional ground methods. In Tennessee, helicopter transmission line construction is quickly becoming the technique of choice throughout the region. The Grand Ole Opry is the longest running live radio broadcast and one of Tennessee’s claims to fame. Beginning in 1925, the “radio barn-dance” helped to make Nashville the country music capital. However, Davy Crockett’s birthplace has a lot more going on from exploring the over 3,000 caves to stopping by the largest freshwater aquarium in Chattanooga and paying a visit to the only lake formed by earthquakes, Reelfoot Lake. Historic Knoxville isn’t the only Tennessee hotspot with a lot of redevelopment projects on tap. New commercial and residential construction projects, as well as infrastructure repairs and maintenance, make the Volunteer State ripe for state-of-the-art transmission line construction. The helicopter view above Tennessee is, of course, breathtaking, but a climb up Lookout Mountain outside of Chattanooga will yield a spectacular view of seven states if Mother Nature cooperates. FairLifts is ready to connect utility companies, Tennessee municipalities, contractors and project managers with the best of transmission line construction services in the Volunteer State. We help businesses, local governments and more gain access to a growing network of experienced pilots, operators, and linesmen offering up a diverse menu of aerial options. Read on to learn more. When it comes to construction, redevelopment and infrastructure projects, heavy lift helicopters provide a go-to service by transporting equipment, raw materials, supplies and more to even the remotest spots in Tennessee, including the Great Smoky Mountains. Unlike conventional ground transportation, heavy lift helicopters do not need access roads to transport and lift materials into place. Once the utility poles are installed the heavy lifting part is finished. However, the next aspect of bringing power to a new place or turning the lights back on for homes and businesses requires the stringing of wires. When done using ground methods, this process can take days or even weeks. When helicopters fly into the picture, stringing wires can now be completed in hours. This is a huge difference when Tennessee residents are sitting in the dark. Installing utility poles is an arduous task when done using ground transportation and crews. Whether utility poles are being replaced due to age or damage or are being installed to bring power to new places in Tennessee, helicopters provide a more efficient alternative to removing, installing and replacing utility poles. Most commercial or private projects in Tennessee require right-of-way and site inspections. Helicopters can take to the air to complete pre-construction surveys, traffic studies, infrastructure inspections and more, completing the job in a shorter amount of time than conventional methods. As project managers understand, the logistics involved in a project of any magnitude is massive, involving the movement of materials, crews and more. Helicopters can transport people, equipment and supplies to even the hardest to reach locales in Tennessee, flying offshore into canyons and to the tops of mountains. Aerial transport doesn’t rely on roads and can even lift materials and hardware into place, cutting job site work time in half. For state-of-the-art transmission line construction options in Tennessee, FairLifts can connect businesses, local governments and more with a network of trained pilots and operators. Our seasoned staff can help procure the ideal service for your commercial or private project. Call or fill out our online contact form for free quotes, consultations or questions.